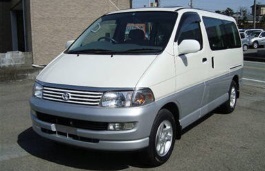 Correct Wheel Sizes, PCD, Offset, Rims and Tire specs for Toyota Hiace Regius series. Can you help me? I've seen some alloys I actually like but need to be sure they'll fit my 1998 Hiace Regius G KCH-40G. They are 17"x7.5" offset 25, cb106.1(but spigots will solve the 67.1 issue) My main concern is the clearance of rear shock absorbers, so what size tyres would best suit? Thanks for any advice given..
Hi,Tony Knight,What your current tire and wheel size?If the new wheels are compatible with your current wheel size,You will do not concern about it.